Trace CD onto scrapbook paper. Cut the circle out of the scrapbook paper and cover the back with glue stick. Press the sticky side of the circle to the CD. Cut a small triangle from orange paper and glue to the front of the CD, sticking out over the edge. Glue a feather to the top of the CD. Glue a feather to the right side (back) of the CD for the tail and another to the front (center) of the CD for the wing. Add googly eye with white craft glue. 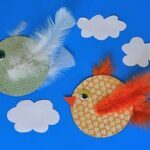 This project for Recycled CD Crafts: Colorful Birds was printed from CraftsbyAmanda.com - https://craftsbyamanda.com/recycled-cd-crafts-colorful-birds/ and can only be printed for education or personal use.